Katharine Smith (sometimes spelled Katherine) was born July 28, 1812 in Lebanon, New Hampshire. She was the second daughter of Joseph Smith Sr. and Lucy Mack Smith. She was 15-years-old when Joseph received the golden plates. Katharine supported and believed in her older brother's prophetic calling. She was baptized when the church was organized in 1830. In January 1831, Katharine married a blacksmith named Wilkins Jenkins Salisbury. Together they would rear eight children, four sons and four daughters. The Salisbury's followed Joseph, Emma and the rest of the Smith family to Kirtland, Ohio, then to Missouri and on to Illinois. Katharine was living in Plymouth, Illinois in 1844 when she was notified of the martyrdom of her brothers Joseph and Hyrum at Carthage Jail. Katharine and Wilkins did not follow the church to Utah, opting instead to remain behind in Illinois with her mother and remaining siblings. Her husband died in 1853. In May 1857 she remarried to Joseph Younger. She spent her remaining years serving the community in Hancock County, Illinois. 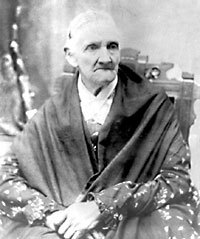 The last surviving member of the Joseph Smith Sr. Family, Katharine died on February 1, 1900, at her home in Fountain Green, Illinois. Thus fulfilling a blessing given to her by her father, prophesying that she would live to a good old age. This was quite the prediction considering most of the Smith children died before they hit 40.